Home / News / Create Space is Growing! 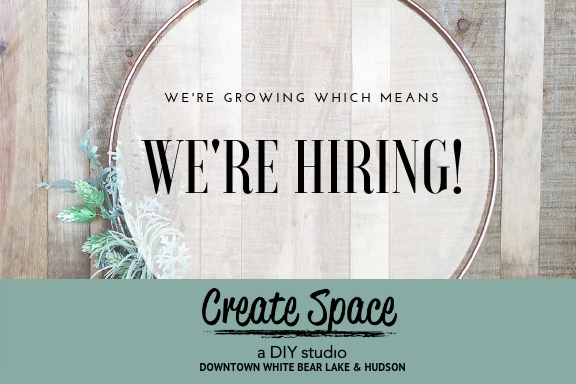 Create Space is growing it’s White Bear Lake space and adding a second location in Hudson, WI. With this growth, we’re growing our team. We’re looking for part-time evening and weekend instructors at both our locations, along with day-shifts on Wednesday and Thursday in White Bear Lake. Our ideal candidate would enjoy creating things, be comfortable working with tools, computers and graphics software, have experience leading group activities or teaching, and enjoy working with both adults and kids. You don’t have to be an expert with tools, building or design but you would need to be comfortable working with them and open to learning. Instructors start at $10-15 per hour depending on experience. Leading a structured class with ease and flexibility. Providing individual and group instruction of DIY projects. Guiding customers and assisting with decisions during the creative process. Using power tools, computers and other equipment. Operating cash registers and handling customer payments. Prepping materials for classes and completing inventory. Promoting Create Space and it’s products at the studio, during events and with other businesses. Answering questions, providing customer service and hospitality. Comfortable with learning and using tools and technology. Maintain a positive attitude with a focus on customer experience. Ability to perform basic math and fractions. Ability to occasionally lift up to 40 pounds. Teaching or group instruction experience is preferred. Interested in applying? Email katie@yourcreatespace.com for more information. Previous post: Opening soon in Hudson, Wisconsin!